Friday night not only involved sushi and beer, but we also managed to watch an unexpectedly hilarious movie - The Heartbreak Kid with Ben Stiller. Laughed so hard I almost peed my pants. Here I am "throwing" the rock. Like a pro. 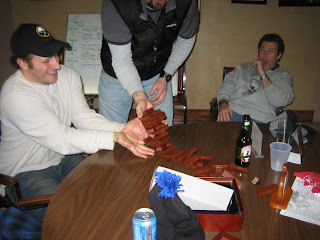 In between games, you get to go into the club house and watch everyone else make a fool out of themselves. Speaking of making a fool of yourself - whoops! 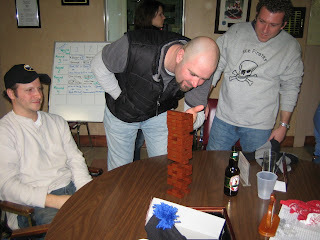 Here's Marc and Brian calculating a strategy. 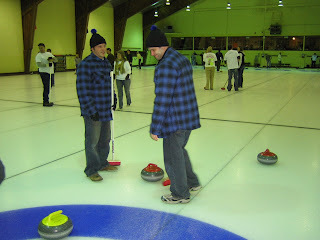 And apparently it was a strategy that worked because "The Hoser's" came in first place! 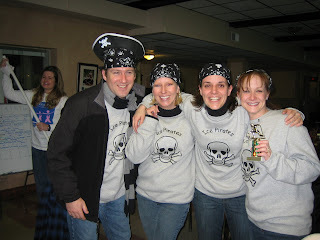 And the "Ice Pirates" won the team spirit award. And as if that wasn't enough fun for one weekend, I still got to go to my favorite restaurant to celebrate 2 of my friend's birthdays! 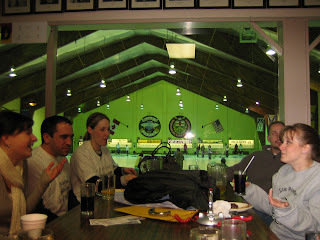 Great food, drinks and company, how could you go wrong? Needless to say we had a great time! And as I'm typing this post, I just got a phone call from my brother to tell me that Courtney is in labor again, but this time it's good news!!! I think it was more than 10 weeks ago that she went into labor the first time and she's been on bed-rest ever since. But now the baby should be big and healthy, so instead of this being a scary time, it's a very exciting time. I wonder if he'll be born tonight! I'll keep you posted! Amanda, I am very familiar with the term "hosers" lol and we too watched "Heartbreak Kid" and almost peed our pants this past weekend. I think perhaps we have some things in common. ha haha. 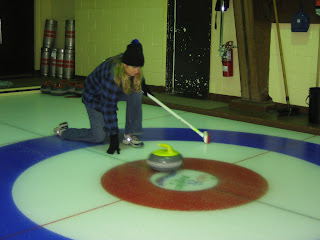 I went curling once in my life...what a disaster! Looks like you had a much more successful night than I! 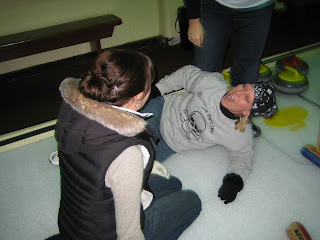 Too fun! I loved the heartbreak kid - a little uncomfortable at some parts but overall HYSTERICAL!!!!!!! 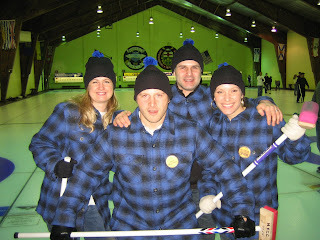 And I must say The Ice Pirates are one good looking team, especially that handsome gent in the pirate hat!!!!! This looks like a blast!! Isn't "Hoser" from the movie Strange Brew? Eh?? I will definitely have to see the heartbreak kid--LOVE Ben Stiller!